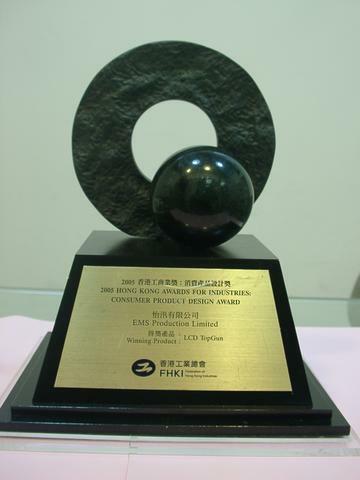 has won the 2005 Hong Kong Awards for Industries : Consumer Product Design Award - 2nd runner-up : !!! EMS PRODUCTION LTD. is specialized in TV game accessories. Since EMS has been established in 1993, we have designed and produced many creative products with the latest technologies. Upon years of hardworking, we gain the support of many customers. In last year (2005), we started to develop the 1st ALL-SCREEN lightgun so as to match the needs of the market. Within only several months, our LCD TopGun was successfully developed and released to the market, which is commended and recognized by many buyers and gamers over the world. 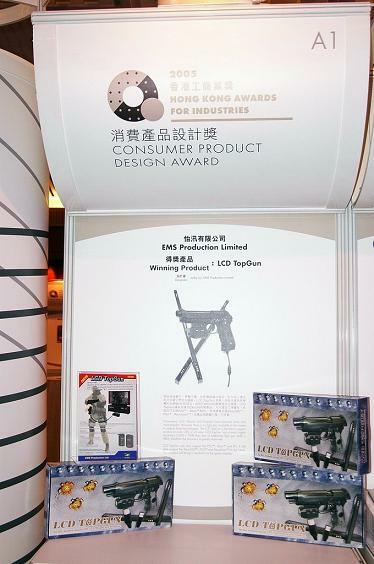 In the same year, we attended the competition of “2005 Hong Kong Awards for Industries: Consumer Product Design Award” with our LCD TopGun. 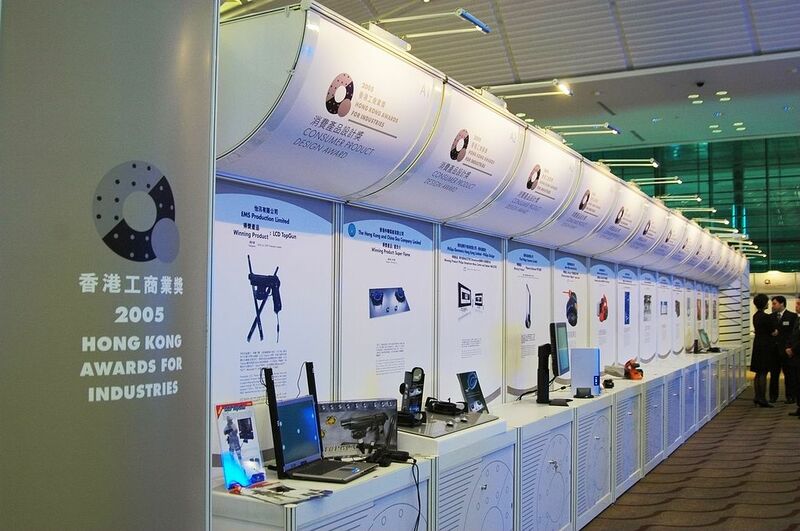 This award is the premier awards scheme �C the only awards championed by the HKSAR Government. After several judgments and the final judgment by seven jurors, the LCD TopGun won as the runner-up amount 141 entries. The Final Judging Panel said that, the LCD TopGun won this award for its useful functions, effectiveness, creativeness and high technology. And it is more important that LCD TopGun could match the trend of the market. The presentation ceremony was hold on 27th Feb, 2006 at the Hong Kong Convention and Exhibition Centre. The Chief Executive of the HKSAR government �C Mr. Donald Tsang and several officers have attended this ceremony. 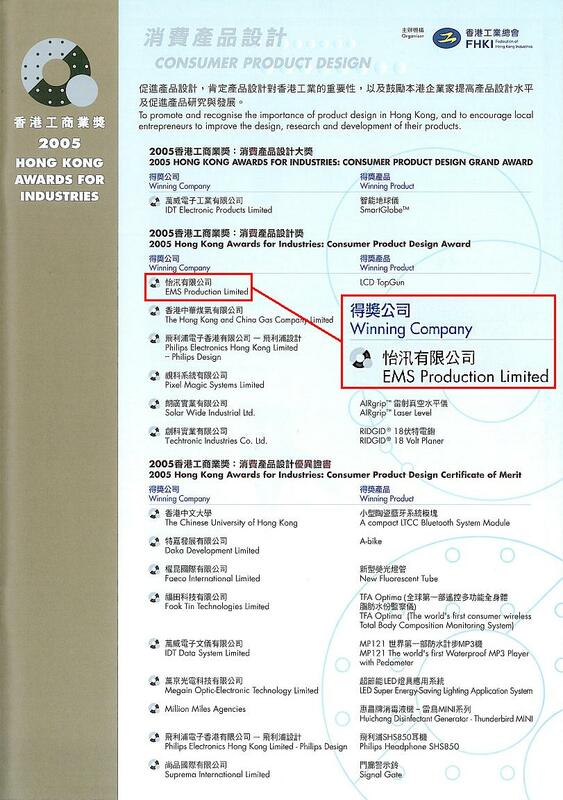 The Chairman of “Federation of Hong Kong Industries” - Mr. Kenneth Ting awarded the “Consumer Product Design Award” to EMS Production Ltd. Our LCD TopGun is recognized as an awarded product by the Federation of Hong Kong Industries. The logo of the “Consumer Product Design Award” could be found on the EMS LCD TopGun box to indicate this honor. EMS PRODUCTION LTD. 由 1993年成立以��, 主力是�[��C�L��a品�_�l, �O�及�裼眯碌碾�子技�g, 生�a各式各�佑��意�a品, 多年�淼玫礁黝�客的支持. 在2005年度, 本公司�榕浜鲜�鲂枨�, 研�l LCD TopGun, 在短短�翟卤惆旬a品研�l成功及推出市��, �K得到世界各地�I家, 用家支持, �J同及��p. 同年EMS�⒓恿擞上愀酃�I���主�k的 "香港工商�I��" 之消�M�a品�O�比�, 此比�是特�^政府唯一�J可的���, 由141名�⒓诱咧�, ��^多次�u��, 及最�K�u��, 由 7名委�T���x出, �Y果 LCD TopGun�s�@第二名. �u判分析�a品得��原因, 主要是功能及效用���, 配合科技革新, 有��意及追�N科技潮流. �e行�C���x式在 2006年2月27日香港���h展�[中心�e行, 由香港特�e行政�^行政�L官曾�a�嗉岸辔幌愀酃�T出席�C��典�Y, �K由香港工�I���主席太平�士丁午�塾H手�C�l��座�c EMS. LCD TopGun被香港工�I����J可�榈锚��a品, EMS LCD TopGun 包�b品盒上���N有 "消�M�a品�O���" 的�苏I, 以�_�J�@份�s�. Click here to see the reports on different newspapers. Click here to see the congratulation letter from HKBC. EMS Production Ltd has an interview with Ming Pao reporters. 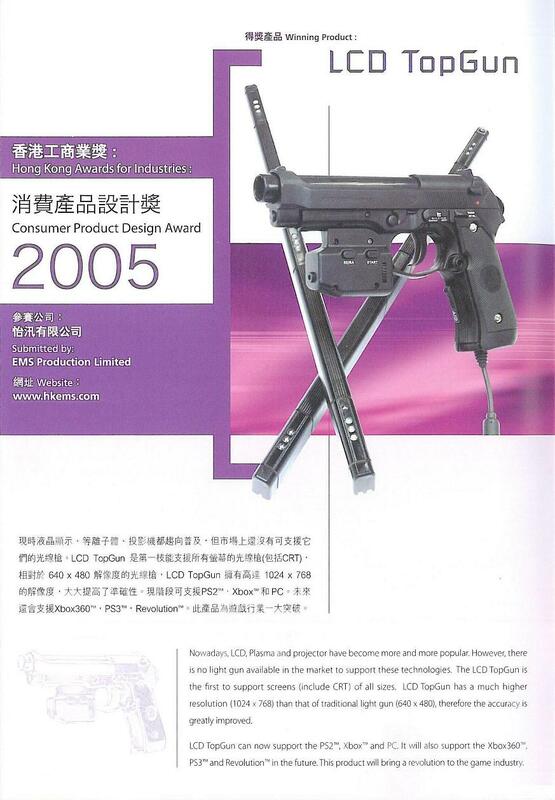 Label of "2005 Hong Kong Awards for Industries : Consumer Product Design Award"